"I tried hard to like this podcast. I listened to about a dozen installments. Guests were interesting. Unfortunately, I couldn't get past the behavior of the host. He speaks in an affected radio voice, steps all over his guests with his 'witty anecdotes,' and keeps referring to himself, in the third person, as "America's radio sweetheart." If this podcast gets a new host, I'll be back on board. Until then, I remain unsubscribed." Well, since you asked for it, I'm writing in with some thoughts regarding your radio show that is now being broadcast via WNYC here in NYC. I must say I had an immediate (negative) response to your self-assigned title of "America's Radio Sweetheart." What's that all about? And what gave you the balls to give yourself that title? I mean, someone like Ira Glass is indeed America's Radio Sweetheart - but only bc he's been the radio f o r e v e r and bc he is broadcast all across our country. Just thinking it's a bit premature to be self-assigning such a title to yourself! sheesh. So what makes you YOUNG anyway? We have NO IDEA how old you are - I wld think if you're gonna lay claim to YOUNG you'd better qualify yourself. Sounds to me as to you're around 45, btw. And your subjects haven't exactly been cutting-edge "young." Dunno why, but WNYC has been running your add ad naseum - I honestly don't want to hear it ONE MORE TIME. I don't want to hear that you're "marginally employed" and that you make good meatballs. PUHlease. The show? Guess the show is OK. Heard your bit with Amy Sedaris. Heard yesterday's show with live mic guys from the 70's - a WHOLE HOUR on these guys, I ask you? Cudda been a twelve minute segment. Anyway, as you wld say, thanks for listening. If you'd like to add some good to the world, why not review one of our great shows in iTunes? Or how about this -- send an email to your local public radio station saying you love The Sound of Young America, and would love to hear it on their airwaves! FOLKS, IT'S AS EASY AS THAT! Maximum Fun LA Meetup: Friday April 13th! The Sound of Young America / MaximumFun.org SoCal meetup is Friday, April 13th, 2007. Mark your calendar for 8PM. We'll meet at the Bourgeois Pig, at 5931 Franklin Ave in LA. This moderately insufferable coffeehouse is right next door to our next stop, and we can have some cups of Morrocan mint tea. 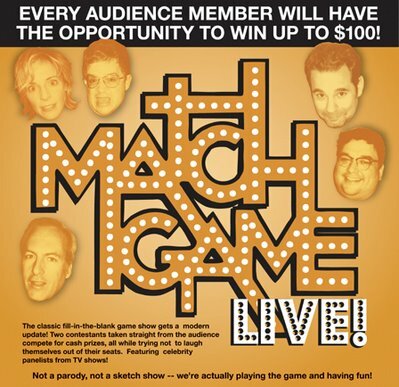 Then, we'll catch the late show at the UCB (should start at 9:30) -- it's The Match Game, starring podcast superstar Jimmy Pardo and friends. Hopefully one of us will win the hundred dollar prize and cover everyone's outlay on overpriced tea a few hours earlier. All in all, ten or fifteen bucks well spent, says I. One note: the Match Game will require reservations. They're not available yet, but I will post here on the blog and on the forum when they are. When you make your reservations, please email me your confirmation as an RSVP, so I know how many people to expect. Best way to read, listen, etc: Subscribe! RSS has made my life dramatically better. Instead of visiting six or eight web sites a day... I read 100 blogs in my RSS reader. I never miss a beat. DO YOU?! If you like The Sound of Young America, why not subscribe? Subscribe to the TSOYA Blog in almost any reader! Subscribe to any of our shows in iTunes! Juice podcatcher for Windows -- with our podcasts all set up! Juice podcaster for Mac -- with our podcasts all set up! If anything goes wrong with the site for the next week or so (broken links, whatever), please let me know via email (jessethorn at gmail). We're moving the site, and may have some hiccups.